What can one say about this fellow. He has some of the oldest lines from Baylock Kennels in his background making him a very important asset to my breeding lines. On the weekend of the 5th & 6th Of May 2012, Phoenix got his title in style at the Bulla Amenities Show (The Maple), going Best In Terrier Group then followed on with Best Exhibit In Show, under international judge, Col J Purkhiser ( USA ) what an amazing acheivment, he wasn't even 12 months old. On the previous day at the Bulla Amenities (The Oak) Show he was awarded Group 4. 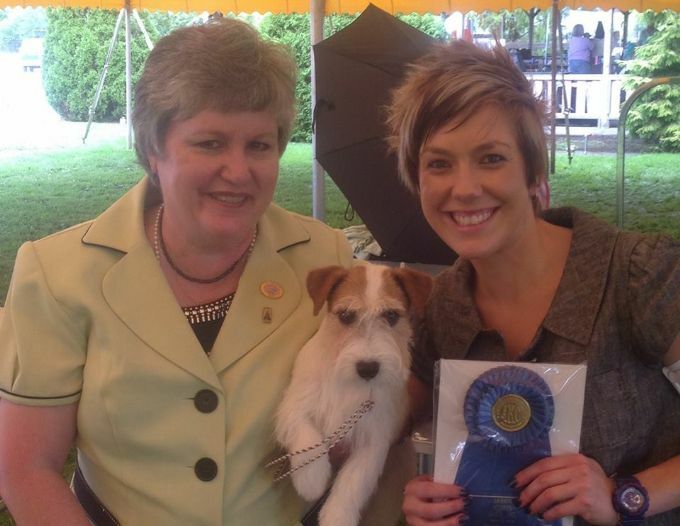 He headed off to the United States, where he was in the very capable hands of Alison Sunderman, who guided him to Best In Show at the inaugural Jack Russell Terrier National Championship Show against top competition from around the USA. He also had many group wins while there and finished his time over there as the number 1 on their All Breed and on their Breed Totals. Thank you to Mark & Laurie Urlich and Alison Sunderman for taking on this Aussie boy. Phoenix has landed back in Australia and has started where he finished off with a Best In Group win at the Easter Festival K.C. Show. Phoenix is being handled by Nicky Renwood.